Another new limited edition that you’ll all be keen to get your grubby mits on. A nice tidy Volvo from Dyce Carriers fleet, with some rather flashy images on the cab. Have a read of the press release as there’s no point in me trying to re-type it in my own words!! 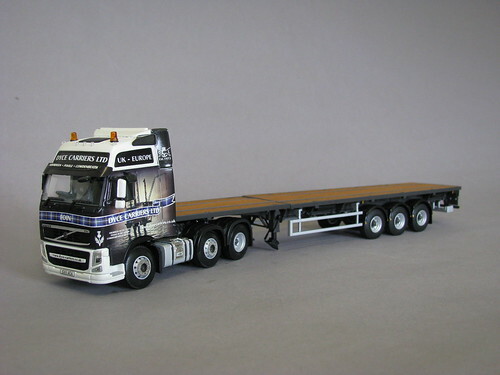 Customised promotional model vehicle specialists, Search Impex, are pleased to announce the release of a 1:50 scale Volvo FH13 Globetrotter XL (6×2) with 3 axle, extendable trailer, customised in the unique livery of Aberdeen based operator Dyce Carriers Ltd. The model has been produced exclusively for Search Impex by WSI Collectibles and is a certificated Limited Edition (205 pieces). With two depots in Scotland (Aberdeen & Cowdenbeath) and one in England (Poole), Dyce Carriers has come a long way from its humble beginnings back in 1973 when, joint founders, David & Jean Moir started the Company with a great deal of ambition and a Morris Minor van. Today’s operation runs a fleet in excess of 50 commercial vehicles (a mix of Volvo, DAF, Mercedes & Iveco units ) and a variety of trailers, including extendables, flats, curtains and stepframes. The business specialises in serving the transport needs of oil and gas service providers as well as local engineering companies and loads can vary from small, urgent consignments, through to groupage, full loads and even helicopters. 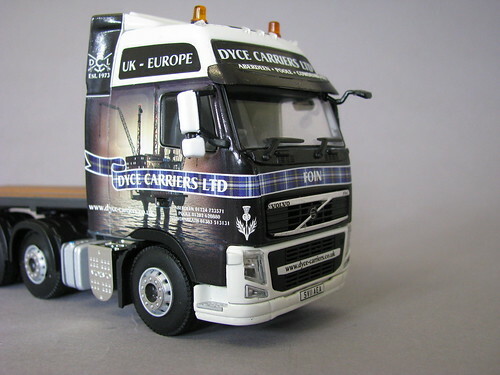 Operating throughout the UK and with some work in mainland Europe, Dyce Carriers’ trucks will already be a familiar sight to many truck collectors and enthusiasts. Models, available from Search Impex, are priced at £143 each (including UK delivery & VAT). For details of availability of this and other models, collectors can visit the Search Impex website at www.search-impex.co.uk or call them on 01332 873 555. This entry was posted in For Sale, Models by truckbloguk. Bookmark the permalink.